The billet continuous casting machine can be designed as curved and vertical-bend according to the users requirements. It can cast carbon steel, alloy steel and special steel, such as stainless steel. The steel continuous caster mainly consists of middle tank, crystallizer, vibrating mechanism, spindle rod, secondary cooling channel,a pull straightening machine and cutting machine.COOLDO Can custom-made CCM for different requirment in the metallurgy. 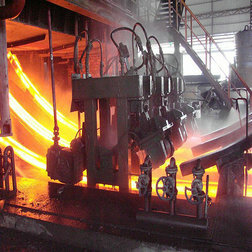 Continuous casting machine is the process of Continuously pouring high temperature molten steel into one or a group of water-cooled copper crystallizer,The Molten steel gradually solidifies into a billet shell along the periphery of the mold, when the steel liquid surface reach to a certain height,The billet is pulled out after the shell is solidified to a certain thickness.The casting billet is completely solidified by secondry cooling system,the steel billet is cutted into length with the cutting machine(fire cutter or hydraulic cutter),the CCM simplifies the production process, improves production efficiency ,saves energy consumption, reduces production cost and improves billet quality. Now in the steelmaking enterprise, , the continuous caster is almost inevitable equipped. Cooldo can design and manufacture the up-to-date billet continuous casting machine in accordance with the user’s steel making capacity, billet size, steel grades and the user’s field conditions. 1)Just need a small floor space and operating easily.2)Compact structure, can be installed through hanging the whole machine.3) Easy installation and needs less time. Low requirements for operators. It can be used to casting low carbon, medium carbon, high carbon steel, alloy steel and stainless steel. 1, The small footprint, the worktable can be adjustable fiexible according to the different installation methods . 2, A variety of pouring ways, can adopt the manual lifting ladle , crane crane casting, rail car casting, electric furnace casting and so on. 3, The 2.5 m and 3.5m casting machine heightcan be installed in the house, and can design the continuous casting machine under the ground 1m which can be cast directly by electric furnace. 4, The compact overall structure, the whole installation can be done by crane, short installation time ,users just need connected to the water and mains power can run the continuous casting machine. 5,Steel billet size is small,users just need to equip 25 or 30-type rolling mill and during the working process,just need to raised temperature 300 ℃ (billet temperature at 950 ℃ or so) to achieve continuous casting and rolling. 6, No limit of the the amount of molten steel, can vary from 100kg to tons , machine can start and stop freely, boot time is short, can be completed in 10 minutes. 7: No detail requirements of operator quality , short-term training can operate. 9: Our continusous casting machine are suitable for medium and high carbon steel, alloy steel, stainless steel and so on. 10:The most simple design structure, reducing items of maintenance projects to ensure the normal operation of the casting machine.